On March 26, 2015, Miami Beach will celebrate the centennial of its first incorporation date. Since 1915, Miami Beach has become one of the most prominent tourist destinations in the United States. At one time, it was referred to as “America’s Playground”. The land that became Miami Beach began with rather humble beginnings. Prior to 1882, the only inhabitants of the land were those found at the Biscayne House of Refuge. There were eleven structures built along the Florida coast line to provide relief to any ship wreck survivors that made it to shore in proximity of these aid stations. The Biscayne House of Refuge was located near today’s 72nd Street on Miami Beach. The arrival of three entrepreneur’s from New Jersey began a series of events that led to the incorporation of Miami Beach on March 26th in 1915. In 1882, Elnathan Field, Ezra Osborn and Henry Lum purchased about sixty miles of oceanfront land extending from Key Biscayne to Jupiter, Florida. Their plan was to start a Coconut Plantation. At the time, Coconuts were a valuable crop for the hush fiber and coconut oil. Coconut palms were not indigenous to this area, so the three men needed to bring more than 300,000 coconuts from Trinidad, Nicaragua and Cuba. They hired off season life guards from Atlantic City to help them plant along the coast of the land that they had purchased. Hannibel Pierce and his son Charles were the keepers of the Biscayne House of Refuge in 1883 and were tasked with greeting and organizing the landing party that included the three businessmen and their helpers. The three men quickly learned that the elements and conditions of the land were going to make the area inhospitable to cultivating a successful coconut plantation. The coconuts sprouted tiny seedlings and Henry Lum and his cohorts eagerly looked forward to a profitable crop. However, the sprouts proved also to be very appealing to the island’s large rabbit population. Lum battled the rabbits and other critters for seven years before abandoning his effort to make the island a successful plantation. Henry Lum died in 1895 and his share of the land went to his son Charles. One of the investors in the plantation was John Collins. Collins was considered a pioneer in fruit cultivation and decided he wanted to see if he could find success with a different crop. In 1907, Collins began planting avocado and mango trees brought over from Miami. He added tomatoes, potatoes and bananas to generate cash flow while the trees matured. Once these crops were ready for shipment, Collins realized his biggest effort would be to haul his harvest to Miami for shipment. It had to be loaded on a wagon, hauled through the mangroves and loaded on a boat to get across the bay for shipment by train. After four years of this process, Collins decided to dredge a canal directly from the location of his crops to Biscayne Bay. However, John Collin’s farming operations were draining his cash reserves. He asked his children and their spouses for financial assistance. He urged them to come see his operations in Miami. After spending a day at his plantation, his children were convinced that this place could become an incredible seaside resort. The south side of the island had already become a popular day trip destination for the residents of Miami. It is unclear whether it was 1901 or 1904, but Richard Smith built a two story building on land he leased from Charles Lum, the son of Henry Lum. The building was intended to provide shelter for those who would come over to the beach from Miami. It was located just north of the land that became Government Cut in 1905, a government sponsored project to build a shipping channel into Miami. This area is located in what is now referred to as “south of fifth” on Miami Beach. In 1908, Avery Smith (no relation to Richard Smith), arrived from Connecticut and visited the site of the two story building. Avery Smith saw an opportunity to provide a resort at this location and bought the building and had the land lease transferred to himself from Charles Lum. Avery Smith had operated boats back in Connecticut. He convinced a friend to join him in Miami to run boats from downtown Miami to the south side of the beach, where their bathing casino was located. This structure became known as Smith’s Casino. It was a bathing casino, not to be confused with a gambling casino. Ferryboats, including two named Mauretania and Lusitania, made trips from Miami’s downtown docks to the casino twice a day. In April of 1913, Dade County Sheriff, Dan Hardie, opened a rival bathing casino with a restaurant only a block north of Smith’s Casino. Both Casinos thrived into the early 1920s as popular destinations for early Miami residents. Smith Casino would later add a sandwich bar. In 1915, this sandwich bar would be the place that Joe Weiss would work when he first arrived in Miami Beach. 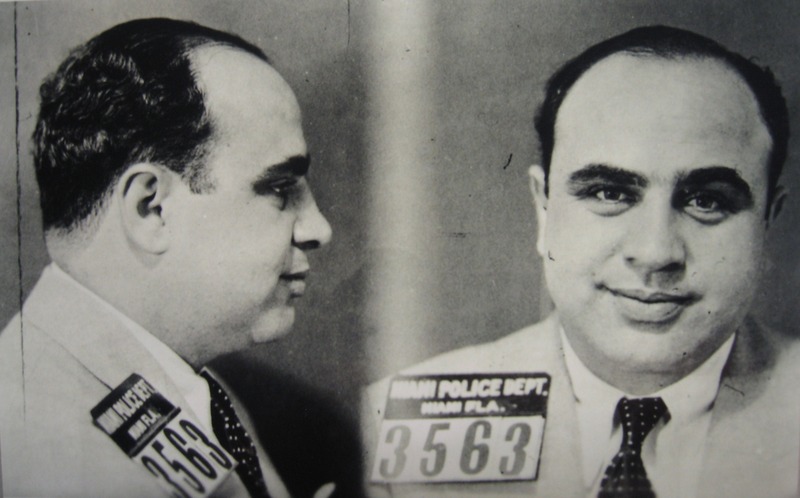 Three years later, in 1918, Weiss bought a little house on Biscayne Street and opened a restaurant he called “Joe’s Restaurant”. This restaurant would later change its name to “Joe’s Stone Crab”. It is still thriving on Miami Beach today. In 1912, after Collin’s children convinced him that his stretch of land could be so much more than just a fruit plantation, he and his son-in-law, Thomas Pancoast, scheduled a meeting with J.N. and J.E. Lummus to seek funding for a bridge. The Lummus brothers were bankers in downtown Miami. Collins and Pancoast believed that building a bridge would accelerate the value of the beach by providing a method to travel to the island by automobile. Not letting go of his dream to make his crops successful, Collins also saw the bridge as an opportunity to move his produce to Miami easier. Collins and Pancoast got the loan to build the bridge. They formed the Miami Beach Improvement Company and began marketing to interested parties to buy lots on the beach. The name of Collin’s real estate company may have been the first time the term ‘Miami Beach’ was used to describe the sandbar. The bridge slowly began to cross Biscayne Bay from north of downtown Miami. Residents of Miami made daily visits to the site to see the progress. The bridge was assembled from a million and a half feet of lumber and, once completed, would be the longest wooden bridge in the world. However, Collins had run out of money roughly a half mile short of his destination. A partially completed bridge would be disastrous for the Miami Beach Improvement Company. One of the interested onlookers was a Miami resident that built a home in the Brickell neighborhood. The gentleman’s name was Carl Fisher and he was one who never could pass on a good opportunity. He approached Collins with a proposition to help him finish the bridge in exchange for 200 acres of prime land stretching from the ocean to the bay. The land was located between what is today’s fifteenth and twenty third streets on Miami Beach. Collins agreed to the deal and the Collins Bridge was ready to open on June 12th in 1913. Opening day was a big deal for the City of Miami. A large crowd of formally dressed Miami residents formed at the Miami side of the bridge to witness the opening. Thomas Pancoast was the first to cross the bridge by automobile. Collins had planned on charging a one dollar per car toll to cross the bridge. Fisher and the Lummus brothers thought the fare was a bad idea considering that the ferry was only charging twenty five cents per passenger. Ultimately, both Fisher and the Lummus brothers paid Collins $2,500 a year to reduce the toll to twenty five cents per car. In the early 1920s, the Collins Bridge was already obsolete. The bridge was replaced by the more substantial Venetian Causeway in 1925. 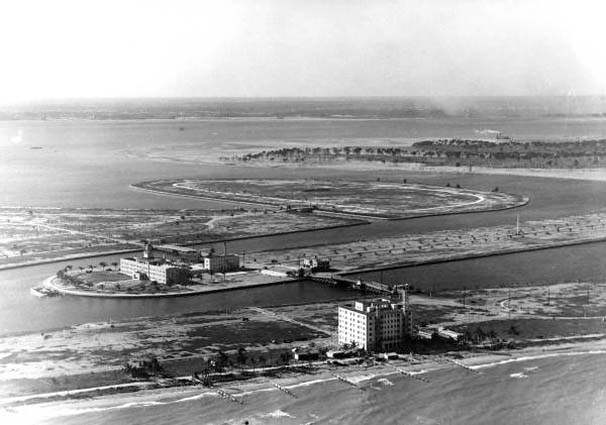 There were a number of islands created from dredge that were connected by the new causeway including (from west to east): Biscayne, San Marco, San Marino, Di Lido and Rivo Alto. Formerly named Bull Island, Belle Island was a natural island, which was expanded over time, at the western edge of the Venetian Islands. After Collins and Pancoast approached them for a loan, the Lummus brothers made a sizeable investment in land on the beach. They bought almost six hundred acres of land at the southern tip of what was then considered a sandbar. They saw the opportunity to build a resort north of Smith’s casino on what they were calling Ocean Beach. Most of the purchase of land by the brothers was acquired from Charles Lum. In 1912, the Lummus brothers, along with Avery Smith and others, developed the Ocean Beach Realty Company. The land managed by this company started at Biscayne Street and went as far north as Fifth Street from south to north. It started two blocks west of the ocean and as far west as today’s Washington Avenue. Today, most of this land is referred to as south of fifth by Miami Beach residents. By 1913, the Ocean Beach Realty Company was running out of money. In early 1913, J.N. Lummus borrowed $150,000 from Carl Fisher, who made his money selling Presto-Lite to Union Carbide in 1913 for $9 million. The $9 million by today’s valuation would be worth over $210 million. In exchange for financial assistance and other help, Lummus gave Fisher over one hundred acres at the north end of the brother’s land. With this exchange, Fisher now possessed 300 acres of land on the future Miami Beach and was in position to become the most significant developer in what became “America’s Playground”. The Lummus brothers built the Ocean Beach Realty Company office at the northeast corner of Ocean Drive and Biscayne Street. The streets were originally named for fruits and trees and later renamed to today’s street names as part of a city ordinance in 1927. 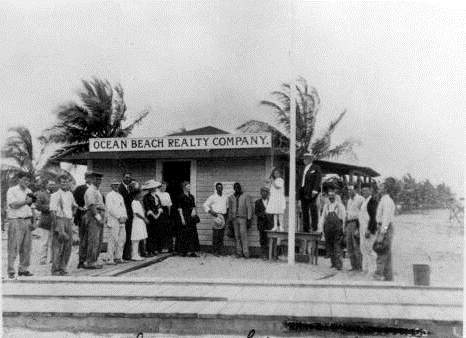 The one story, wood frame building was not only the headquarters for Ocean Beach Realty, but became the location of Miami Beach’s incorporation in 1915. Things were progressing rapidly on the beach and all of the significant land owners felt it was time to formally organize the area. On March 26, 1915, J.N. Lummus, John Collins and Carl Fisher gathered at the one story wood frame building on Ocean Drive and Biscayne Street and incorporated the town of Miami Beach. While there were 150 residents of the area at the time, there were only 33 registered voters that participated in the incorporation vote. J.N. Lummus was elected the first mayor. Shortly after incorporation, the town built a two story town hall at 609 Collins Avenue. Also in 1915, Scotsman William J. Brown opened the town’s first hotel. The hotel was named Brown’s Hotel and it is still standing today. It is the location of one Miami Beach’s most popular restaurants, Prime 112. This was also the time that Avery Smith, owner of Smith’s Casino, built his small coral rock house on Collins Avenue and Ninth Street. This home also still stands today and is a popular tourist stop for those visiting Miami Beach. Although Miami Beach was only incorporated as a town in 1915, it quickly out grew township status. On May 1st, 1917, Miami Beach was incorporated again, but this time as the City of Miami Beach. At the onset of the 1920s, shortly after the end of World War I, Miami Beach became the darling of a new class of wealthy, many of them friends of Carl Fisher. Miami Beach began a journey unlike any other city in America. Over the course of the month of March, 2015, there will be many celebrations to commemorate the centennial of Miami Beach. Its history is fascinating. Following incorporation in 1915, the city continued to evolve from decade to decade over the next 100 years. Some of those times good, and some of those not as good. Provided it remains above sea level, the next 100 years promise to be just as fascinating. Book: “Miami Beach: A History” by Howard Kleinberg, Arva Moore Parks and John Gillian. Book: “Sunshine, Stone Crabs and Cheesecake” by Seth H. Bramson. Book: “Miami Beach” by Seth H. Bramson. Book: Saving South Beach by M. Barron Stofik. 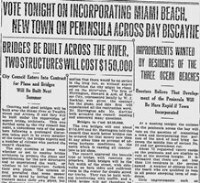 Miami News: “Vote Tonight on Incorporation of Miami Beach”, March 26th, 1915. Miami News: “Miami Beach, 35 Years of Growth”, March 25th, 1950. Miami News: “Miami Beach Turns 65”, March 25th, 1980. 2 Comments on "Incorporation of Miami Beach in 1915"